Q: What is rough scheduling by theory of constraints? How does it different from theory of constraints scheduling? A: Theory of constraints scheduling has a target of proposing a short-term schedule and then providing the job instructions at the work site. The results of calculation determine the job sequence. 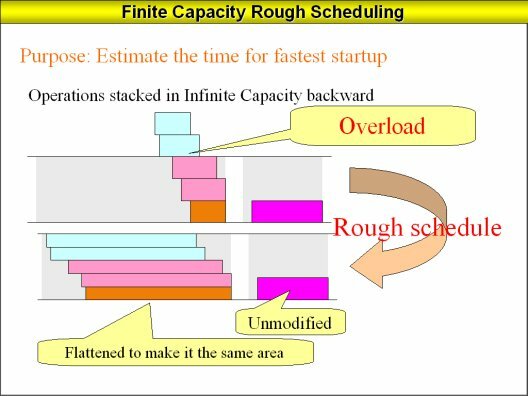 The purpose of rough scheduling by theory of constraints is to set up proposals for midterm and long-term schedules that calculate load checks, fastest timing and required quantities of materials and fastest required timing for input of manufacturing orders. It is scheduling by theory of constraints without deciding what the job sequence is. With mid-term planning there are many instances in which the job sequence will be changed, so that if we steadfastly determine the job sequence in advance that will delay the fastest timing for raw materials and the fastest timing for input of manufacturing orders. With rough scheduling by theory of constraints the system does not decided what the job sequence is, but it determines what the fastest timing for materials and manufacturing orders is. The actual method of calculation allocates jobs by backward theory of constraints then applies processing in which work from the overloaded sections is pushed down from the top to stretch it out and eliminate overloads. Theory of constraints scheduling can provide greater precision in mid- and long-term scheduling than infinite capability scheduling using MRP's fixed lead-time.